Beautiful certificate from the Manchester, Carriage and Company Limited issued in 1873. This item has the signatures of the Company's Director's and Secretary and is over 135 years old. The origins of local transport in Salford can be traced back to John Greenwood (1788-1851), who, in 1824, commenced what is believed to be the first omnibus service in the country, running between Pendleton, in Salford, to Manchester. It was such a success that within 25 years there were over 60 similar omnibuses vying for passengers on the main road into Manchester. Greenwood's son, John Greenwood Junior (1818-1886), inherited the business on his father's death in 1851, by which time the business owned almost 200 horses. With mounting competition, negotiations were started between the main rivals with a view to forming a joint company. In 1865 the idea came to fruition with the formation of the Manchester Carriage Company. When the Tramways Act of 1870 became law, the neighbouring councils of Manchester and Salford entered into negotiations for the provision of a tramway connecting the two towns. In 1875 powers were granted for the construction to begin, and, on Friday the 18th May 1877 public services commenced, being operated on behalf of the two towns by the Manchester Carriage Company, since the 1870 Act precluded the operation of tramways by local authorities. When the 1886 Tramways Act removed this restriction, both authorities made plans to seek powers to operate the tramways themselves. 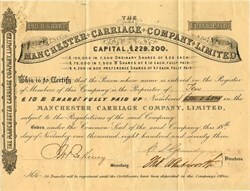 The Manchester Carriage Company's lease of the Salford lines expired in 1898, but they were granted an extension so that the lease expired at the same time as that of neighbouring Manchester, on the 27th April 1901. In the event, due to a misunderstanding in the valuation of the Company's assets, Salford Corporation was unable to conclude a deal until the 1st May 1901. The following day, 2nd May 1901, Salford Corporation acquired 94 of the Company's horse-tramcars, along with 906 horses; the first Salford Corporation operated tramcar service leaving Pendleton at 4am that morning. In 1899 the decision had already been taken that, on acquisition, the horse-tramways would be converted to electric traction and some parts of the track had already been re-constructed by arrangement with the Manchester Carriage Company (by now the Manchester Carriage and Tramways Company). An initial order for 100 tramcars had been placed with G. F. Milnes & Co., of Birkenhead, and the first of the order arrived on 14th September 1901. By the 4th October, sufficient tramcars had been delivered to enable the first route to be opened, that between Kersal Bar and Blackfriars Bridge, Manchester. On the 14th October the section between Kersal Bar and the Grove Inn on Bury New Road was opened, and on 21st November the Chapel Street to Irlams O' Th' Height, via Pendleton, line was opened. As the track construction and introduction of the electric trams went ahead, the original horse trams had continued to work routes until they were electrified, but on 25th March 1903 the last of the horse drawn tramcars was withdrawn and the system became fully worked by electric traction. Three years later on the 2nd October 1906, when the route to Worsley opened, the system was substantially complete, connecting with the lines of other operators at its extremities, although through working was not fully exploited until the 1920's in the face of competition from bus services. Salford Corporation had first invited tenders for the supply of a single bus in October 1919, but it was not until 5th July 1920 that the first motorbus, a Leyland 36-hp open-top double-decker (No. 1: BA2594) went into service, operating between Pendleton and Great Cheetham Street, over roads which had never had a public service before. In November and December of the same year, orders were placed with Leyland Motors for additional single- and double-deck vehicles. When the second bus arrived, the original route was extended from Pendleton to Weaste. In order to accommodate the new bus fleet it was proposed to build a separate depot at Weaste, where land had been purchased, the tramcars already being housed at a depot on Frederick Road. On 14th March 1921 a second bus service began, running from Victoria Bridge to Langworthy Road, via Liverpool Street, although by 1927 there were still only three bus routes in operation, despite the acquisition of more buses. In 1927, however, Salford Corporation gained powers to run its bus services outside the borough and there was a gradual increase in the network. Competition from private bus operators had forced Salford Corporation to introduce through tram services with neighbouring authorities in order to compete, but this did little to stem the tide. In an effort to drive competitors off the road, more bus services were introduced, even, in some instances, competing with its own trams. Eventually, however, most of the private companies were bought out and the way was clear for Salford to expand its services. On the 19th March 1932, the through tram service to Middleton, via Rhodes was withdrawn, and three years later, on the 9th March 1935 the branch lines to Swinton and Pendlebury from Irlams O' Th' Height were closed, beginning the decline of the tramway system. Complete closure had been planned for 1939, but the advent of World War II delayed the end, which finally came on the 31st March 1947, when the last tram ran on the Deansgate and Docks circular. In 1946 Charles Baroth was appointed General Manager of the undertaking, which now became Salford City Transport. He instituted a replacement policy for the dilapidated wartime fleet, ordering an additional 210 buses to supplement the 65 already ordered by his predecessor. At the same time the livery was changed from red and cream to green and cream. By 1952 the whole of the prewar bus fleet had been replaced and no further vehicles were ordered until 1962, ten years later. In the interim period, Salford City Transport consolidated and improved its services, maintaining a smart and reliable fleet, which was the envy of many other authorities. Charles Baroth retired in 1965, just four years before Salford City Transport became part of the newly created South East Lancashire and North East Cheshire Passenger Transport Authority, almost 35 years after J. W. Blakemore, Salford's General Manager from 1933 to 1946, had suggested a similar idea. Thus, on 1st November 1969, after almost 70 years of municipal transport, Salford City Transport vanished, together with the justly famous green and cream vehicles that had for so long been the pride of the city.